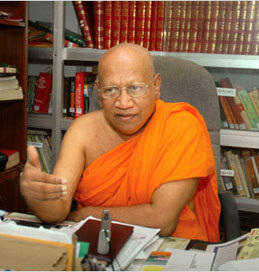 May Most Venerable Professor Bellanwila Wimalarathana Anunayaka Thera attain Supreme Bliss of Nibbana! This page is dedicated to share the personal messages for the Anunayake Thera. 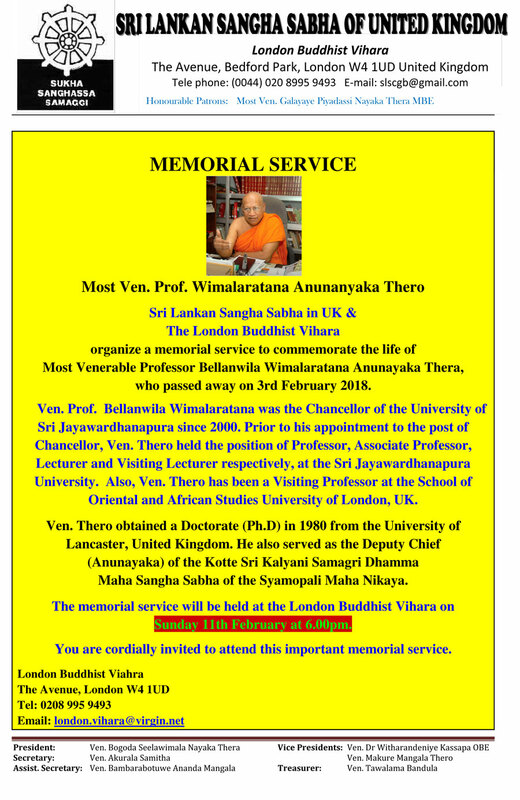 Special Memorial Service will be held on Sunday 11th February at 6PM at London Buddhist Vihara. All are kindly welcome to attend. All are kindly welcome to attend. 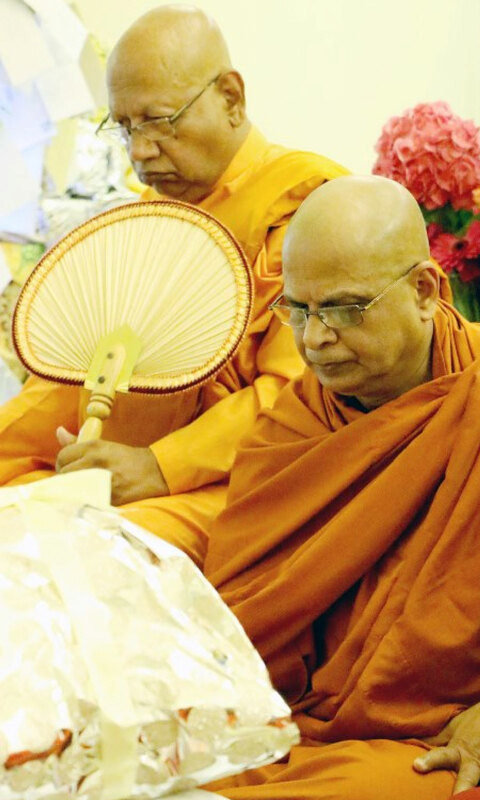 Venerable members of the Srilankan Sangha Sabha in the United Kingdom express the heartfelt deepest Sympathies to the Maha Sangha of the Bellanwila Rajamaha Viharaya on the passing away of Most Venerable Professor Bellanwila Wimalarathana Anunayaka Thero, due to the tragic incident. It is indeed a great loss for the Sangha Comminity in the world and to the Buddha Sasana at large. He was a world renowned erudite scholar, author, and most eminent member of the Sangha nationally and internationally. He had gained his Phd in the University of Lancaster, and he was a lecturer and then a senior professor of Buddhist Studies and finally became the chancellor of the same university of Sri Jayawardhanapura. He was the general Secretary of the world Buddhist Sangha Council. The sad news was a huge shock to all of us. Professor Wimalratana Anunayaka thero of the Kotte Sri Kalyani Samagri Dharma Maha Sangha Sabha & the Chancellor of the University of Sri Jayawardhanapura in Sri Lanka, had a close relationship with the Maha Sangha not only in Sri Lanka but also all over the world, especially in the UK. May Most Venerable Anunayaka Thera attain the Supreme Bliss of Nibbana! Please CLICK HERE to send your message... Thank you. As he was well known figure in our time, it is unbearable lost for world Sangha community as well as Buddhist community in the world. May he attain everlasting happiness of Nibbana. Birmingham Buddhist Maha Vihara U.K.
On behalf of the East London Buddhist Cultural Centre, I offer my deepest condolences on the sudden demise of Most Venerable Professor Bellanwila Wimalarathana Anunayaka Thero, following a tragic incident. In this moment of grief and sorrow, our thoughts are with all monks and devotees around the world. Being an eloquent, disciplined and an erudite Buddhist scholar, Wimalarathana Anunayaka Thero forthrightly represented the Buddhist belief and rendered a great service to the nation and Buddhism by his committed leadership in matters of national and religious importance. He always had the ability to show a correct path among diverse opinions. He is one of the great monks who appear rarely in the history of a nation. He also pioneered in making progress towards fostering inter-religious harmony in our country. 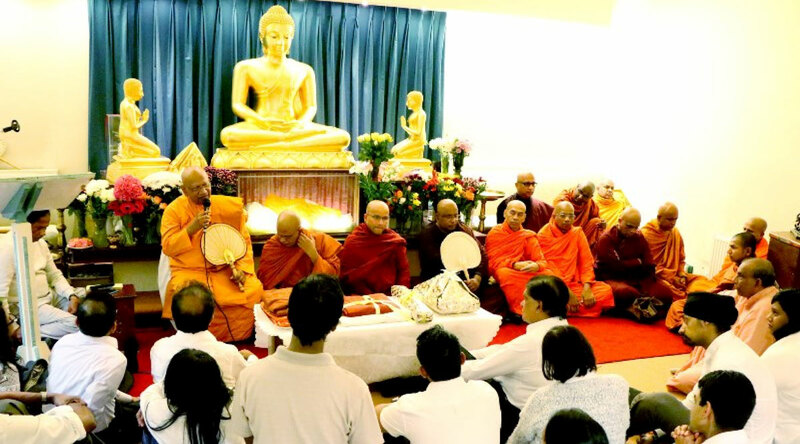 Wimalarathana Anunayaka Thero had a great quality to address people from all walks of life, with a heart of loving kindness, living up to the Buddhist principles and concepts. Even though Anunayaka Thero was conferred with a title which the whole world respected, he never changed his humble behaviour within the sangha community. He tirelessly guided the masses using his broad knowledge and abundant experience to spread Buddhism around the world, while not seeking any recognition in return. During our short journey, Wimalarathana Anunayaka Thero assisted our temple immensely. He always offered his wisdom and often spared his valuable time to grace the events of significant at our temple and milestones we have achieved so far, with his heartfelt blessings. The popularity and respect he earned in a comparatively short time is testimony to the impact his personality and activities had on the Maha Sangha and the Buddhist public. His untimely demise is a great loss to the Buddha Sasana and to the country. May Venerable Bellanwila Wimalarathana Anunayaka Thero attain the Supreme Bliss of Nibbana!